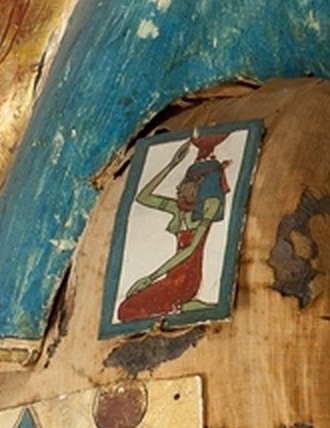 Coffin of Henettawy with Isis and Nephthys at the feet of the cover. XXI Dynasty. Photo: Metropolitan Museum of Art of New York. Finally, the ancient Egyptian artist could not omit two of the most important figures in the dead’s resurrection: Isis and Nephthys, the two professional mourners, who making a mourning ritual gave the faculties back to the mummy. In the cartonnage of Irtirutja these two goddesses are depicted making a typical mourning gesture and are located at both sides of the mask. 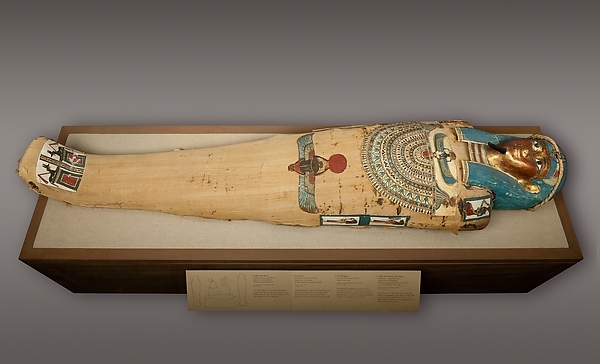 In many ancient Egyptian coffins and cartonnages the two professional mourners Isis and Nephthys could be located at the feet of the mummy, in the frontal chest under the image of Nut and also at both sides. Two square pieces of cartonnage with the images of both mourners were located at both shoulders of the dead, next to the two lateral locks of hair of the mask. Was this location gratuitous? We do not think so, because, according to funerary texts of Ancient Egypt, “the two locks of hair in the funerary mask were Isis and Nephthys” (Coffin Texts 531). And the hair was an element closely related in the thought of Ancient Egypt to the mourners and to the body’s recovery. The presence of the two mourners Isis and Nephthys in the cartonnage of Irtirutja was a need., omething essential for the mmmy’s resurrection. Their location at both sides of the funerary mask was not gratuitous, since it was the place of the two locks of hair, the two mouerners. Lunar Rituals with Hair in the Ancient Egyptian City of Heliopolis.